‘Airline’ was one of the many house brands of musical instruments originally produced by CMI (Chicago Musical Instruments), a company founded in 1920. Their electric models using DeArmond pickups were similar to Harmony instruments with some small cosmetic variations and different pickups. Multi-diamond bridge pickup (one of two) in chrome with integral flat bezel and black infill, woodscrew-fixed, on timber base, in Airline 8448 archtop guitar. 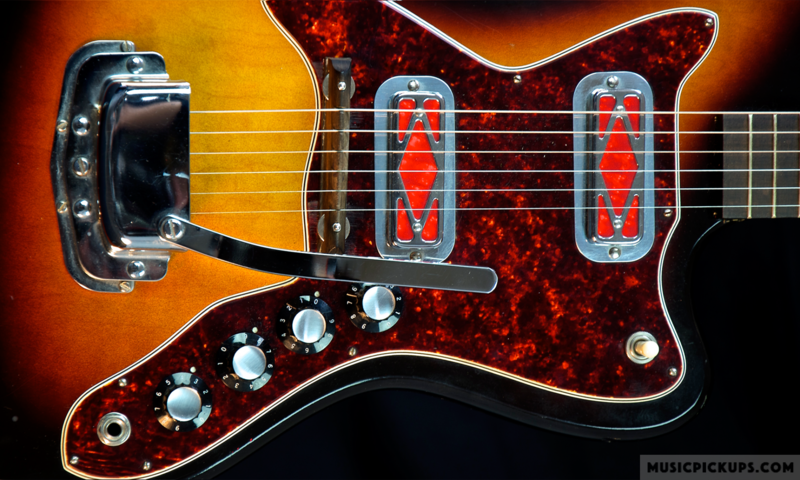 Multi-diamond bridge pickup in chrome with integral raised bezel and white infill, screwfixed to Airline Stratotone 7215 dated 1964, shown below. The bridge pickup is raised but the neck pickup is flat (B0157). The Airline instruments shown on this page are as follows. Some are identified by their Harmony reference, as their Airline reference is not yet clear. B0535 1965 Airline guitar as Harmony Bobkat H14 (photo copyright Jim DeStafney of Blues Angel Music, Pensacola, Florida). Airline Stratotone 7215 dated 1964 (B0157). B0440 1967 Airline version of Harmony H46 Stratotone guitar with two plain Hershey Bar type woodscrew-fixed pickups. The neck pick pickup is screwed direct into the body and the bridge pickup is seated on a timber base to attain the extra height necessary. 3-pickup Airline H7209 Roy Smeck guitar with distinctive pickguard. The pickups are chrome multi-diamond type with white infills. The neck pickup is riveted directly to the pickguard, the middle pickup is very slightly raised and the bridge pickup raised more, at approx 1/16”. 1959 Airline 8448 guitar, as Harmony H70 Thinline (B0577 photo copyright leatherstuff.com). B0386 1960s Airline guitar as Harmony H78 in Redburst finish with three four-slot pickups with gold foil infills. The neck pickup is woodscrew-fixed direct to the guitar body but the bridge and middle pickups are mounted on timber bases.